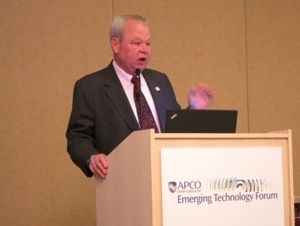 Farrill was one of two Board members of the First Responder Network Authority (FirstNet) to address the APCO audience. This is the first time anyone from FirstNet has come out to speak to an APCO audience. The Middle Class Tax Relief and Job Creation Act of 2012 created FirstNet and made the dream of a Nationwide Public Safety Broadband Network (NPSBN) a reality. FirstNet is the governing authority created to oversee the planning for and buildout of the network. Dr. Rebecca Blank, Acting Secretary of Commerce, announced the members of the Board at the 78th Annual APCO International Conference & Expo in Minneapolis. The standing members of the Board are the Attorney General of the United States, the Secretary of Homeland Security and the Director of the Office of Management and Budget. Samuel Ginn was selected to chair the FirstNet Board. FirstNet Board member Kevin McGinnis, chief/CEO for North East Mobile Health Services, the largest paramedic service in Maine, also addressed Forum attendees. McGinnis tapped his years of experience in emergency medical services to outline some of the benefits public safety can hope to see from the realization of the NPSBN. Just some of the things he sees as important to patient care are two-way video in the ambulance, creating the possibility of a virtual MD in the patient compartment, particularly in rural areas with long transport times; the transmission of CT scans and ultrasound video and images to an emergency department for interpretation to assist in choosing the appropriate destination hospital (e.g., trauma center or stroke center); remote monitoring of firefighters’ conditions on the fireground; and crash data from telematics to help determine the likelihood of injuries and the appropriate response to deploy. FirstNet recognizes that “The network needs to be more reliable than commercial networks — a reliability you can bet your life on,” said Farrill. The Board has only been working together for a little more than three months at this point, but they’ve already received a great amount of input from the public safety community, including requirements documents from NPSTC and SAFECOM. FirstNet now has a list of more than 1,300 detailed public safety requirements. “We have a great opportunity to leverage the information and incorporate all those features and capabilities into the network,” said Farrill. Although the legislation established initial funding sources and streams for the network, “$7 billion is not going to build the ultimate, forever system,” said McGinnis. “The commercial carriers spend about $25 billion each year just keeping their systems up and running,” said Farrill. Among other things, there’s a plan to locate Network Operations Centers in every state. However, Farrill said there will be two “listening tours” before any plan is presented. Objectives for the network are that it be ubiquitous, reliable, redundant and interoperable, and lower costs. McGinnis stressed the importance of transparency in the process. What can APCO members do? Farrill called on attendees to never forget where FirstNet came from, to be the owners as well as its users, to identify their state point of contact and to get involved in the process. LTE is an incredibly versatile technology with great speed and coverage and low cost, and several speakers over the course of the day discussed LTE and its potential and benefits in greater depth. Dereck Orr, program manager for the Public Safety Communications Research (PSCR) Program, and Jeff Bratcher, technical manager for the PSCR, described some of the work being done to influence standards developers to include public safety requirements in LTE, test LTE capabilities and figure out ways to link commercial vendors into the NPSBN. A test plan for utilizing LTE in-building is under development. And work is also underway to determine the variables that will need to be known to determine how many sites will be necessary. “LTE broadband is going to change public safety communications for the better — something that should have happened a long time ago,” said Andrew M. Seybold, CEO and principal consultant, Andrew Seybold Inc.
Panelists from T-Mobile, AT&T, General Dynamics, Northrop Grumman and PCIA discussed ways they anticipate the commercial sector can partner with and support public safety in the network, up to and including a shared network core. 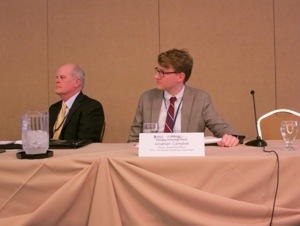 One session departed from the general broadband discussion. 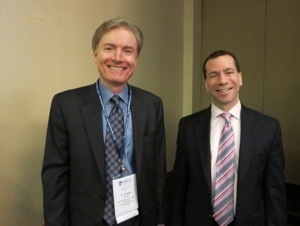 Motorola’s Chris Wilson gave an update on P25 TDMA. The day wrapped up with a discussion of some of the apps that have already been developed for public safety, including PulsePoint, which alerts CPR-trained bystanders if a cardiac arrest victim is in their vicinity; Elerts, which allows to people to use their smartphone to contribute their knowledge about a public safety problem as it unfolds, and two-way communication allows a safety or security professional to ask for additional details or to give instructions on what to do next; and Assure911, which would allow system managers to monitor text-to-9-1-1 activity. 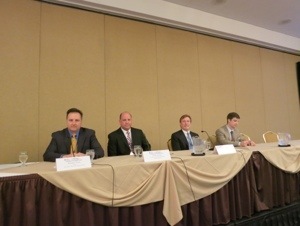 Attendees of the Emerging Technology Forum left the event with a wealth of knowledge to take back to their agencies. 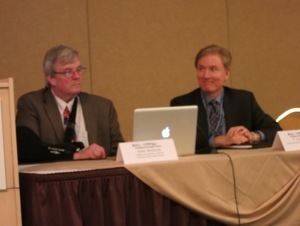 You can learn more or download presentations from the event website. Keri Losavio is the editor of Public Safety Communications, the official magazine of APCO International.